Personifies everything I hate in movies yet oh how I laughed. Well-so far I haven't read one good review of this movie on here. I don't have a lot to add except growing up, this was one of my favorite comedies. This is totally slapstick, lots of chases and things breaking-silly and almost plot less-but oh how I laughed. I'm not quite sure WHY I did but I have never been able to view this movie without breaking out into Gales of laughter. Since I'm writing a review, I'd like to try to give a specific reason Why this off the wall, completely silly movie appealed to me so much but I can't because there is no reason. This movie is ridiculous in it's way, but it knows it, and doesn't Take itself at all seriously. It's like Seinfeld-a movie about nothing. (Except Chases, things falling, breaking etc). That's it. But It's funny. It's mindless and it's entertaining and I loved it! Since, I haven't seen it in quite awhile, maybe I wouldn't love it now and I can see how it wouldn't be for everybody but all I know is this is one of the few comedies that rendered me absolutely hysterical through most of it and I'm not the only person who had that reaction. This is coming from someone who isn't particularly fond of slapstick. 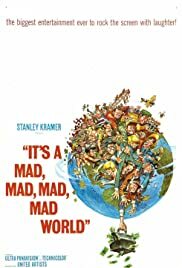 There's not much else to say about it-it's certainly a mad, mad movie and one that gave me numerous laughs many a time. 63 of 103 people found this review helpful. Was this review helpful to you?